Editor’s note: With a great deal of interest among repairers and automakers about the future of auto body materials as cars get lighter and stronger, we today are hosting a “debate” between the steel and aluminum industries. Our goal is to give repairers a sense of what could be coming under the competitors’ visions so body shop owners and technicians can begin to ponder what training and equipment they might need in the next 5-10 years. Here is “aluminum’s argument,” presented with minimal editing by Repairer Driven News. As automakers work toward meeting CO2 and fuel economy targets of 54.5 mpg for the 2025 model year, every vehicle will become lighter in the next decade. Approaches to lightweighting are many. Downsized powertrains and components, smaller vehicle designs, and increased use of mass-reducing materials, such as aluminum, carbon fiber and newer steels. As automakers shake up the material mix in cars and trucks, our automotive customers are making clear—we now live in a multi-material world and without question, more and more aluminum is entering the mix. From saving money on gas, to reducing total carbon emissions, this shift is good for consumers and the planet. Recently, Chevrolet detailed how the 2016 Malibu shed 300-pounds over its predecessor while increasing size. Lighter leather seats, a smaller turbocharged engine, newer steels and strategic use of advanced aluminum alloys in the hood, suspension knuckles and chassis components, are all credited with helping lower vehicle mass. Automakers face a sizeable challenge as 2025 approaches—design and develop fuel-efficient vehicles that consumers want to drive, without sacrificing affordability or performance. To be sure, no two vehicle solutions will be the same, but the need for materials that can deliver significant mass reduction is an unwavering imperative. Lightweight, energy absorbent, easily formed, durable and infinitely recyclable, aluminum is a vital part of the race to 2025. The 2015 F-150 demonstrates those advantages in a real world application and the groundbreaking introduction of the world’s first high-volume aluminum-intensive pickup is only the beginning. What do OEMs have planned? Lightweight vehicle designs are already prevalent and leading automakers, such as Cadillac, BMW and Ford make clear that aluminum is a fast-growing part of the multi-material mix. Aluminum is already the second most used material in the auto industry. Engines, wheels, bumpers, hoods and trunks have lead growth in past years. However, today, use of automotive aluminum is accelerating at a record pace as the body material of choice in the most innovative vehicles currently available: Tesla Model S, Jaguar F-Type and XE, Land Rover Range Rover, Acura NSX and Cadillac CT6, just to name a few. 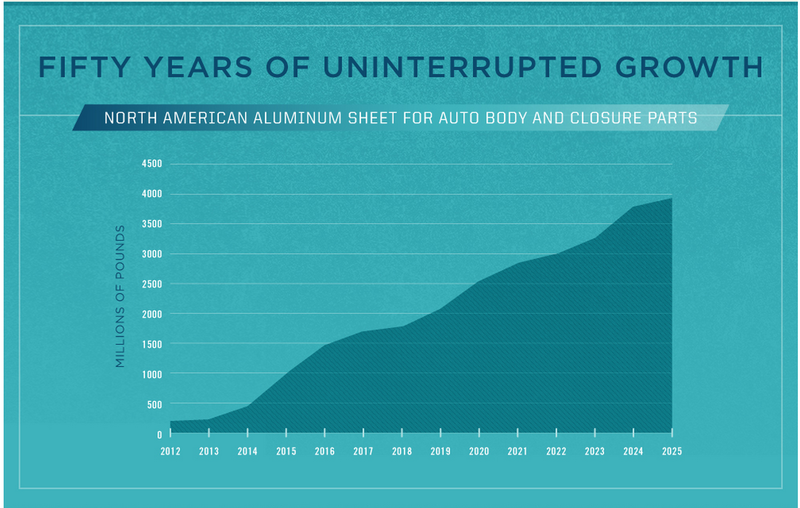 With no signs of slowing, aluminum is poised for 50 years of uninterrupted growth. A 2015 Ducker Worldwide survey of North American automakers forecasts that more than 75 percent of all new pickup trucks produced in North America will be aluminum-bodied by 2025. To put that in clearer terms, ten years from now, three out of every four new pickup trucks on the road will be constructed of high-strength, military-grade aluminum. The successful launch of the 2015 Ford F-150 is certainly a key driver of this explosive growth; however, automakers surveyed also revealed that aluminum will also experience significant growth in the SUV and full–size sedan segments. 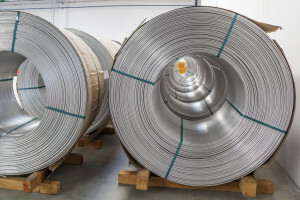 Ducker forecasts that complete aluminum body structures will reach 18 percent of North American production in the next decade, from less than one percent today, and use of aluminum sheet will increase to 4 billion pounds, from 200 million pounds in 2012. Last month, the National Academy of Sciences (NAS) released a report examining the cost, effectiveness and feasibility of deployment of various fuel economy-saving technologies for future light-duty vehicles. The report examines several approaches, including electric and diesel powertrains, but the high-volume, multi-material car is “recognized as the longer-term, optimal approach to mass reduction.” Advantages and challenges of mass reduction through more aggressive use of aluminum, steel, magnesium and composites are detailed in the report. Complexities in Joining – “The traditional steel body shop is dominated by spot welding, a body shop with other materials will likely be dominated by other joining technologies,” according to the report. The growing use of aluminum requires those unfamiliar with the material to learn new techniques. Selection of a specific joining process is dependent on joint functional requirements, production rates and specific manufacturing plant constraints. Broad ranges of technologies developed specifically for high-volume auto body applications are available to join aluminum alloy components with other aluminum parts or with dissimilar materials. Those processes are detailed in a comprehensive automotive aluminum joining manual released earlier this year by the aluminum industry’s leading trade associations. Considerations for joining aluminum to other common automotive materials, including steel, plastics, composites and magnesium are covered. The manual is an essential technical reference tool that can be downloaded at no cost at DriveAluminum.org. Repair of vehicles with extensive use of aluminum is not difficult, it’s different. Bumpers, hoods and trunks made of aluminum are repaired by most body shops today, and there are plenty of aluminum-bodied vehicles on the road that are regularly repaired as needed. As more high-volume vehicles convert to aluminum, the need for education and training will continue to increase. The industry professionals at I-CAR, the Inter-Industry Conference on Auto Collision Repair, are on the frontlines. Through collaboration with OEMs and suppliers, technicians are educated through certification courses that address new repair standards for multi-material vehicles. Galvanic Corrosion – Both aluminum and magnesium are “susceptible to galvanic corrosion when joined with dissimilar materials,” explains the report. You’ll note cost is not an observed challenge by the NAS report. Cost became a non-issue when Ford confirmed that the base model of the 2015 F-150 would be priced at just $395 more than the 2014 version, despite the array of new equipment and technology. The report does address cost through the comparison of several mass reduction scenarios and concludes, “projecting the future cost to reduce mass is very difficult.” Cost versus value is also weighed as the report acknowledges that for OEMs the competitive advantage in key attributes of performance, handling, braking and noise and vibration, offered by low weight vehicles often outweighs sheer price. Multiple studies have long shown that aluminum brings secondary weight and cost savings benefits in areas such as a downsized engine and lighter suspension and brakes—all of which help reduce the total vehicle cost. The key to innovation is collaboration. As automakers continue to reach new limits, we are with them every step of the way. Top aluminum companies worked together, alongside Ford, to create what now stands as a watershed vehicle for the automotive industry. The F-150 underscores aluminum’s inherent advantages and mass-market viability, and signals where the market is headed. There’s an incredible materials evolution under way in the auto industry—happening even faster than many predicted. The road ahead for aluminum is bright…but so too is the road for next generation vehicles and the consumers who drive them. Everyone wins when cars and trucks are lighter, safer and drive farther on a gallon of gas. To help fuel this change, aluminum companies are pursuing advanced technologies that will support automakers as they reimagine the automobile from the wheels up to take a more holistic approach to innovative designs. Doug Richman is the technical committee chairman of the Aluminum Association’s Aluminum Transportation Group (ATG).